Information on the next webinar will be posted here soon. Information on the future webinars will be posted here soon. Citizen volunteer water monitoring is one of the most popular and effective forms of citizen science, and there is a growing interest worldwide for community groups to collect scientifically valid data for the protection and restoration of their surface water and watersheds. Global Water Watch (GWW) began in the early 1990s in response to interests by community groups in several countries to become personally involved in water issues. This webinar will describe the origins and approaches of GWW in the US, Asia, Latin America and Africa and how these experiences led to the creation of a GWW model for community-based water monitoring and watershed stewardship. Case studies, data-to-action strategies, success stories and challenges will be presented. Dr. Bill Deutsch is a Research Fellow, Emeritus in the School of Fisheries, Aquaculture and Aquatic Sciences at Auburn University (Alabama, USA). He has undergraduate degrees in Zoology and Anthropology, a Master's degree in Biology and a Ph.D. in Aquatic Ecology and Fisheries. Bill directed the Alabama Water Watch and Global Water Watch programs for 20 years and continues his involvement with these programs, and two nonprofit organizations related to them, in his retirement. He has made about 100 international trips to more than a dozen countries for water-related projects, especially related to citizen science and community responses to watershed issues. Within four years the FP7 project eartH2Observe aims to develop a global water resources re-analysis dataset based on the WFDEI forcing dataset, improved with earth observations and extended with output from hydrological and land surface models that should be off value for multi-scale water resources assessments and research projects. The Tier-1 dataset presented in the webinar consists of a large number of earth observation datasets, a first run of a total of nine global hydrological and land surface models for the period 1979 - 2012 and the WFDEI forcing dataset. All model output has been reprocessed to 0.5x0.5 degree resolution but higher resolution data from some models is also available. The current dataset serves as a state of the art in current global hydrological modelling and as benchmark for further improvements in the coming years. 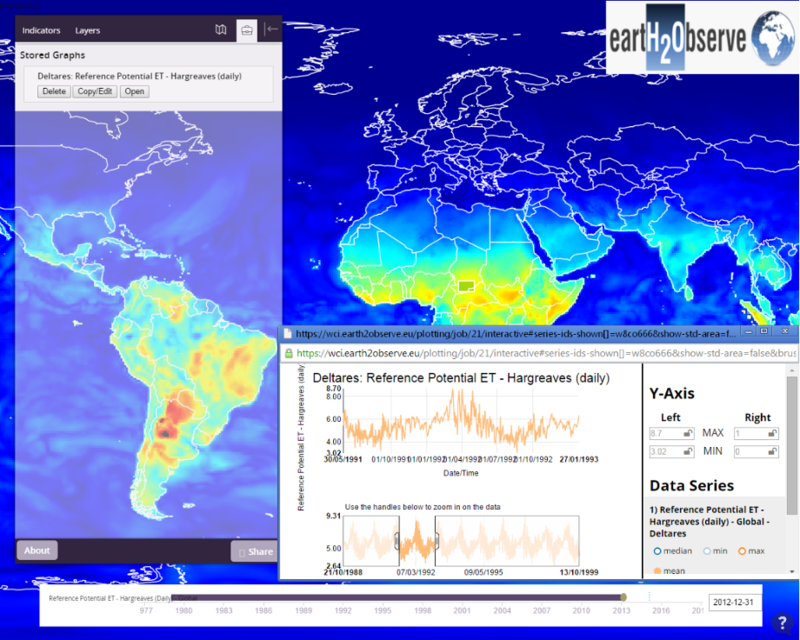 Within eartH2Observe we promote the use of the newly available data at an early stage, feedback and comments will enable the further improvement of the dataset. All data is made available openly through a water cycle integrator portal, including visualisation, analysis and collaboration tools, and at a lower level via the protocols of the open geospatial consortium such as OPeNDAP, WCS and WMS via wci.earth2observe.eu. In the webinar the dataset will be presented and access to the data demonstrated using freely available tools. Download eartH2Observe leaflet here. Since 2001 Dr. Jaap Schellekens has been working for Deltares where he is involved in projects and research related to hydrological modelling, watershed management and flood forecasting. Dr. Schellekens has extensive experience in (forest) hydrology, the hydrological implications of land-use and climate change, hydrological modelling (with special reference to flood forecasting) and hydrometeorological measurement techniques. In addition, Dr. Schellekens has lead a number of large projects related to (probabilistic) flood forecasting and has advised a number of leading meteorological agencies on the implementation of the Delft-FEWS flood forecasting system. Currently he coordinates the eartH2Observe FP7 EU project on global Earth Observation for Integrated Water Resource Assessment. His work has been published in leading scientific journals. We report on the final Diversity II water quality product archive, covering more than 300 lakes worldwide, and providing validation for more than 50 lakes. The 2002-2012 MERIS full-resolution (FR) data used as primary input have recently undergone a first consistent re-calibration, referred to as bulk reprocessing, which corresponds to the 3rd reprocessing of MERIS reduced resolution data. Differences to the previously available MERIS FR archive are discussed in terms of matchup comparisons as well as final L3 products. A summary of several exemplary case studies carried out by product users is given, highlighting the potential of the datasets as indicators for biodiversity and other applications. Dr. Daniel Odermatt is an expert for spaceborne inland water quality retrieval and managing director of Odermatt & Brockmann GmbH in Zurich, Switzerland. He implemented the scientific design of the Diversity II water quality processing chain during a post-doctoral Marie Curie IAPP employment at Brockmann Consult GmbH in Geesthacht, Germany. Half a year ago he founded an independent joint venture with Carsten Brockmann to continue the successful collaboration in Diversity II and other projects. His ambitions are to contrast and structure the exorbitance of study-specific algorithms for optically complex waters developed in recent years, to advance suitable methods to operational applications, to improve the robustness of these applications and to foster their use in environmental monitoring programs and other surveys. Abstract: The talk provided an overview of the maximum peak height algorithm, providing some demonstration and details on new advancements related to the recently released plugin for BEAM (including adjacency effect detection). Results of the validation of the MPH algorithm across a wide range of water types performed in the ESA Diversity II project were presented (courtesy Dr. Daniel Odermatt). The talk discussed the re-calibration exercise for the MPH algorithm, in preparation for a publication. Initial results and approaches were presented from the re-calibration. Bio: Dr. Mark Matthews is an earth observation scientist specialising in the detection of cyanobacteria from space. He graduated from the University of Cape Town in 2014, and has published 8 first author publications (two monographs) in high impact journals, and received several awards and scholarships. He received an innovation award in 2012 from the CSIR for operational monitoring of cyanobacteria and eutrophication in South African inland waters as well as a 2014 Copernicus Masters Ideas Challenge award. His maximum peak height algorithm has been developed as a plugin for the BEAM software. He has worked as a lecturer at the University of the Western Cape, and as a consultant for the CSIR and South African National Space Agency. He is currently a postdoctoral fellow at the University of Cape Town. He enjoys spending time with his wife and two kids, and fishing in his spare time. INFORM is a 4-year FP7-SPACE collaborative project (2014-2017) which aims to develop novel and improved user-driven products for inland water quality (WQ) monitoring by using innovative remote sensing methods coupled with biogeochemical models which fully exploits the improved spectral, spatial and temporal capabilities of upcoming Earth Observation (EO) missions (Sentinel-2, Sentinel-3, EnMAP and PRISMA). 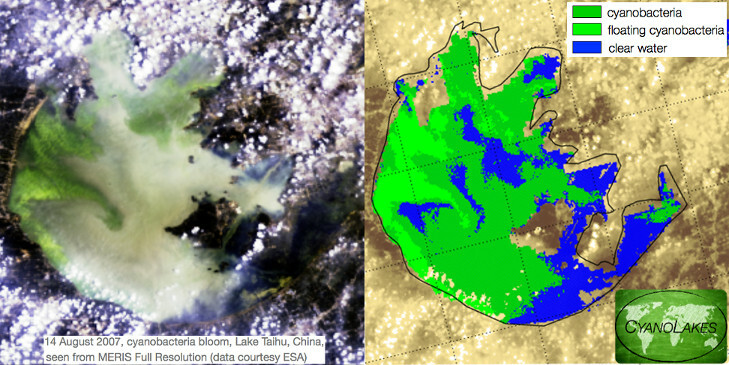 Validated INFORM EO-model products will form a basis for future Copernicus products to assess e.g. the implementation of the EU Water Framework Directive (WFD). INFORM developments will lead to recommendations for future E0 missions taking into account requirements for inland water quality monitoring. Blake Schaeffer earned his PhD in Marine Science from North Carolina State University studying harmful algal bloom ecology. He then served in two post-doctorate positions. The first was a NASA funded project with the University of North Carolina at Wilmington to investigate the impacts of El Nino/La Nina cycles on ecosystem biodiversity in Galapagos, Ecuador.The second post-doctorate was with the U.S. Environmental Protection Agency quantifying optical properties related to the Gulf of Mexico hypoxic zone. He is currently an Assistant Laboratory Directory with the U.S. Environmental Protection Agency, National Exposure Research Laboratory. His research focus is on the use of remote sensing technology to monitor water quality. Interests broadly cover deriving water quality parameters in coasts, estuaries, and lakes using Landsat, SeaWiFS, MODIS, MERIS, VIIRS, HICO, and in the future Sentinel-3 and PACE. His interests generally include integrating remote sensing technologies into decision support frameworks. For example, he developed a satellite remote sensing approach for coastal numeric nutrient criteria. His new research effort focuses on detecting cyanobacteria blooms and disseminating the satellite information via a user friendly mobile device application. Remote sensing technology has the potential to enhance the engagement of communities and managers in the implementation and performance of best management practices. This presentation will use examples from U.S. numeric criteria development and state water quality monitoring programs to illustrate ways remote sensing can be used to advance management practices. In the first example, the U.S. Environmental Protection Agency determined that numeric criteria were necessary to protect Florida's coastal waters from the impacts of anthropogenic nutrients. Florida's coastal waters have not been monitored comprehensively via field sampling therefore existing monitoring data was insufficient to support numeric criteria development. However, satellite remote sensing had the potential to provide more extensive data. Spatial and temporal measures of chlorophyll-a derived from SeaWiFS, MODIS, and MERIS were resolved across Florida's coastal waters and provided a quantitative baseline that could be used to protect against long-term changes in chlorophyll-a resulting from anthropogenic nutrients. Success from the coastal criteria approach has focused new efforts on the validation of an "off-the-shelf" algorithm to identify cyanobacterial blooms, potentially for national application. In this study, available in situ cyanobacterial cell count data from Ohio, Florida, New Hampshire, Vermont, Rhode Island, Connecticut, and Massachusetts were compared with derived cyanobacterial cell count estimates from MERIS. A secondary goal of this project was to develop a stakeholder tool with the capability to monitor cyanobacteria blooms near real-time, and potentially provide predictive capability. Crowd sourcing was selected as a unique opportunity to pool the problem solving skills of >500,000 people worldwide to develop these capabilities. This combined use of satellite technology with crowd sourcing provided a sophisticated stakeholder tool that may allow for more holistic management to reduce exposure risk to the public. The Global Lake Temperature Collaboration (GLTC) began in the fall of 2010 to assemble an international group of investigators with interest in and access to global lake temperature records (both in situ and satellite-based). The GLTC group has since grown to over 50 investigators, and a workshop was held at the University of Nebraska-Lincoln in June of 2012 to bring together all international project participants in a common location to share data, examine patterns and trends, and compile a global lake temperature database. Additional lakes have been added to the database since the 2012 workshop, and the data have been undergoingdetailed statistical analysis. Results will soon be available to data providers and project investigators, with plans for publication shortly afterwards. The over-arching objective of NETLAKE is to establish a network of scientists, technologists, managers and stakeholders focused on the development and application of cutting-edge sensor technology for the protection of European lakes and reservoirs. Deliverables will include a meta-database of instrumented sites, case studies on management-relevant topics, data analysis tools, and a citizen science programme to involve local communities in the protection of water resources. The key deliverable, however, will be the establishment of the NETLAKE network itself, bridging communication gaps between researchers, policy makers and managers, and between scientists and local communities. 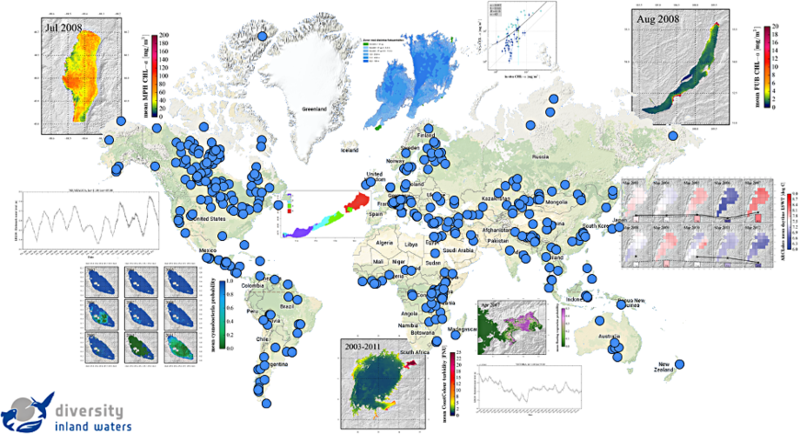 Global Lake Ecological Observatory Network (GLEON) is an international grass-roots, voluntary network of researchers, educators, and community groups interested in making and utilizing time series of high-frequency observations made on and in lakes and reservoirs all over the world. GLEON includes more than 60 lakes and more than 260 individual members from 34 countries on six continents (as of April 2011). The goal is to understand, predict, and communicate the impact of natural and anthropogenic influences on lake and reservoir ecosystems. The researchers include limnologists, ecologists, information technology experts, and engineers who have a common objective of building and growing a scalable, persistent network of lake ecology observatories; developing new theoretical models based on the more extensive spatial and temporal scales of data; integrating new technologies to utilize the data; educating a new generation of researchers; and engaging the public. The GLaSS project has multiple objectives including preparing for the use and uptake of global Sentinel 2 and Sentinel 3 products in the context of lakes and reservoirs and the relationship between terrestrial water, nutrients, sediment and pollutions influxes and lake water quality, setting up prototype enhanced service infrastructures to ingest and process the expected very large quantities of data coming from Sentinel 2 and 3, and developing demonstration cases suitable and user-friendly data-mining and searching techniques for various users to access the data and results. GloboLakes is a five year research programme investigating the state of lakes and their response to climatic and other environmental drivers of change at a global scale through the realisation of a near-real time satellite based observatory with archive data processing to produce a 20-year time series, of observed ecological parameters and lake temperature supported by linked auxiliary data on catchment land-use and meteorological forcing. This presentation was given by Carsten Brockmann & Daniel Odermatt, Brockman Consult (preceded by a short GEO introduction by Steven Greb). The ultimate goal of the Diversity II Project is to support the implementation of the new 2011-2020 biodiversity strategic plan of the Convention of Biological Diversity, and more specifically, to contribute to the assessment and monitoring of the Aichi 2020 Biodiversity Targets of the CBD. In order to meet this goal, the specific Objectives of the Diversity II Project are to provide for selected key parameters, status maps, associated change maps, status indicators and trend indicators. These key parameters for inland waters are availability of freshwater and quality of freshwater, reflected in its water constituents such as chlorophyll-a and/ or suspended matter concentration, as well as by its temperature. The products shall be provided on a global scale by producing results for at least 300 large perennial inland waters and covering a time range from 2002 to 2012.